Wine does itself no favours when it comes to simplicity. Enthusiasts need to get to grips with different regions, a myriad of grape names, vintage variations, each countries’ legalities, and ever-changing legislations. And, as an industry wine has very few brands to familiarise oneself with. It could be said that there’s also the need to speak a number of languages to understand the pronunciations. Ok, it’s not a necessity but it does help. (Heard over the tannoy in a large green-lettered supermarket ‘Try so-and-so Merlott’. And that’s one of the easier pronounceable and recognised grapes). To add to the knotted-vine confusion of this captivating drink, there are a number of well-known grapes that have different names in different countries but are the same grape. Syrah-Shiraz, Pinot Gris-Pinot Grigio, Tinta Roriz-Tempranillo to name some of the more common grape synonym examples. So are they different? And what is the difference? In brief, no, they aren’t different, but in fact the exact same grape. The main reason for the difference in names comes down to style, and the name gives an indication of style produced from the winery using that name. The style is mostly determined by the terroir and climate that ultimately produces a lighter or heavier wine and flavour. A winery may decide to choose a grape name for the label dependent on popularity, customer engagement and market demand. Island Fox Zinfandel Blush from Italy is probably our best example of this. Still wearing a confused frown? Let us attempt to de-code some of the various grapes and their foreign cousins to explain the differences so you know what to look out for when perusing a wine list. This is the grape with perhaps the most commonly used synonym depending on where the grape is produced and what style the wine is. Syrah is a red grape from the Rhone area of France. It is used exclusively in Hermitage, Northern Rhone and and in the South of the region, it is blended with Grenache, Mourvedre and several other grapes to make the famed Chateauneuf-du-Pape and Cotes du Rhone. In its purist form it gives a dry, savoury, powerful wine with a freshly-cracked black pepper note. Shiraz, is the name given to the same grape by Australian winemakers, and gives a character that can be based on black or red fruit but tends to have a riper, fruit forward flavour, jammy even. This is a generalisation of course as wine flavours can be influenced by oak treatment, ageing, blending and grape quality but this gives a starting point. Syrah/Shiraz is produced in many countries; South Africa, Chile, Spain, New Zealand, all of which can use either name but they will tend to use whichever name suits the style of their wines. For example; Martin Fierro Syrah from Argentina, Avanti Shiraz-Malbec from Argentina. In this case the Syrah is from San Juan wine producing area north of Mendoza in Argentina – an area becoming known for producing quality Syrah with the signature fresh black pepper note. Avanti’s style is aimed at those customers used to drinking approachable and easy-going Aussie Shiraz, so they use Shiraz on their labelling to appeal to the target market, blended here with the ever-popular Malbec grape. Sutter Home winery in California invented the sweet pink wine we know as Zinfandel Rosé. Then Italy claimed the Zinfandel grape to be the same as their Primitivo grape (red grape grown in Southern Italy). Zinfandel has become the recognised ‘brand’ so Italy now produces similar sweet pink wines (see Island Fox Zinfandel Blush), and even plays on the American style red Zinfandel with True Zin, an organic big juicy vanilla-packed wine. Wednesday 25th July 2018 is National Wine & Cheese Day, but the thought of breaking out the Port and Stilton in these soaring temperatures doesn’t really appeal! I wish I had a better answer than ‘purely by accident’. I was out of work and accepted a job selling wine tastings door to door. It was horrendous, and only lasted a few months, but it gave me a love of all things vinous and made me look into the wine trade further. Eight years on I still love it (different job – thank god). What has been your strangest job to date? That’s easy. Going underneath a newly built lecture theatre floor on my hands and knees picking up fallen screws and nails before the industrial vacuum cleaner came in. IN THE DARK. I lasted 25 minutes before walking out on the grounds of danger to my sanity – and knees. What is your favourite drink, what would you have it with and where would you be drinking it? Always an impossible question. Who am I with? What’s the weather like? How many people are there? What’s on the menu? Favourite drink is obviously wine but further than that it all depends…. What wine trends are you seeing for the summer period? I think the old world is coming back strong. Whites like Picpoul and Albariño are really gaining ground over the ever popular New Zealand Sauvignon, and French Malbec is becoming better known as well. In general I think the public are becoming far more savvy to their wine preferences so our job is to fuel this curiosity and always be providing something new and interesting – and we love it! What are your interests outside the world of wine? When not drinking wine you can generally find me outside. “There’s no such thing as bad weather, just inappropriate clothing!” So said my Grandpa about a million times. I love fishing – as long as I can eat what I catch (can you eat a compliment?). Camping is another hobby, in our beloved van ‘Brenda’ or Brenda von BlueVan to give her her full title. What is your food and wine pairing heaven? Food and wine pairing heaven to date is Fillet Steak with Peppercorn Sauce and the truly remarkable Cask 23 Napa Cabernet Sauvignon from Stag’s Leap. Heaven defined! And I cooked it myself! However… I firmly hope to give a different answer to this question many times as, like that illusive big fish there’s always another heaven to be found. Tell us something we wouldn’t know about you without asking! I whittle spoons for fun. Enough said? What part of your new job you are most excited about? Another easy one. The people. I could talk about wine all day but it’s people that really excite me. This job allows me to meet people constantly and this makes me happy. What drink is in your hand at the moment? A fine Rioja Crianza that is sadly very nearly empty…. Perched on the banks of the River Douro in Northern Portugal is the historical city of Porto, home to Port wine. Earlier this year, it was announced that 2016 has been officially declared as a vintage year for Port wine by several of the big Port shippers. Single vintage Ports are only declared in the very best years, and this is only the fourth since 2000, the most recent being 2011. Grape & Braai the South African Way! We visited in the third week of January and the all-consuming conversation topic was the drought situation. As you entered Cape Town airport the wall sized poster that greeted you was about saving water during your stay. They were going to be the first westernised city in history to face a water allocation, and with just 6 weeks to go until the taps were stopped mid-March it was all anyone was talking about. The reservoirs were at 21% fill level and you couldn’t use the last sludgy 10%, leaving a very small amount left to satisfy the population. It was too-little-too-late to set up desalination plants in time. Riebeek Kasteel is about an hour out of Cape Town, and part of the Swartland wine region. It was one of the first towns in South Africa, founded in 1661 in honour of the administrator of the Cape, Jan van Riebeeck. It is a small town with approx. 5000 inhabitants. Afrikaans is the main language although most people spoke some English. Above: the famous Short Street in Riebeek Kasteel which is celebrated in a wine range of the same name, using classic Rhône grape varieties. Our host for the week, along with Richard Addison, was Kara van Zyl, Export Manager for Riebeek Cellars. The wine business was much smaller and a lot more personal than I was expecting. André Engelbrecht is the CEO heading up the company which employs around 20 people. They welcomed us openly. Riebeek Cellars don’t own any vineyards per se but have long standing contracts with growers in the area. Throughout the week we bumped into many of the growers who all knew Richard well. They would pass us boxes of table grapes for our journey and spontaneously join us for drinks and Braiis (BBQs) and tell us their stories, mostly related to the water shortage and its effects. It is a close knit community all focused on producing consistently good wine and respecting the environment. We spent a day with Tharien Hansen, their viticulturalist, who is very knowledgeable and a seriously fierce big strong Afrikaan wine farmer, who makes sure they are producing the best quality grapes for Riebeek. She determines when the grapes from each plot are ready and informs the winery that it is time to prepare for vintage. The grapes are picked in the early hours and delivered to the winery first thing in the morning. Alecia Boshoff is their Head Winemaker and has Eric and Jacques working with her, Eric is responsible for white wines and Jacques for red wines. At this critical time of year the hours are extremely long but there is no moaning, they are all aware of the gratification of the end result. We did a full tasting of the wines, and the one that really stood out was Pinotage (our Huntersville). Alecia’s explanation for it being lighter and elegant in style than most Pinotage wines is that it should mirror the character of its parent grape Pinot Noir. Pinotage was a grape created in 1925 in Stellenbosch by crossing Pinot Noir and Hermitage, better known today as Cinsau(l)t. The grapes used for Huntersville Pinotage are cold soaked at 10 degrees for 3-4 days, then 60% are whole bunch pressed. Pinotage is a small berry-sized grape resulting in good colour extraction. The wine is fermented up to 28 degrees to get rid of the acetate (banana character). The wine is then pressed off the skins before being fermented dry. The 2016 vintage shows red plum, raspberry fruit, chocolate and has a soft tannic structure. Delicate, elegant, ripe and rounded. The Pinotage Rosé (our GoldCoast and Lion Ridge), were the group’s favourite. Riebeek have Pinotage vineyards specifically for rosé production. 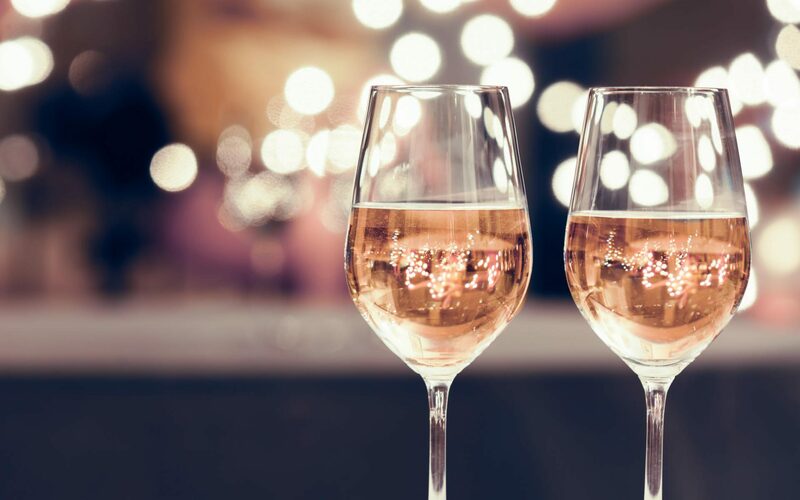 They pick the grapes earlier for rosé, drain off the free run juice and ensure the wine has minimum skin contact, giving a wine of pale salmon colour in a just off-dry style, with strawberry fruit flavour. In the 30 degree heat it was the go-to wine for Braiis or the fresh local seafood and shellfish. The 2017 vintage won the 2017 Pinotage Rosé Award of Excellence at the Pinotage Associations competition. Left on the lees as long as possible, this wine is balanced and rounded, fresh and lifted with lots of aromatic and floral character. Peach, apple, lychee fruit flavours. Fermented on the lees for about 4 weeks, then on fine lees. 50% from bush vines so very labour intensive and lower yields. Bush vine gives the wine more mouthfeel and concentration of flavour. This style of vine growing is also beneficial in the current water situation as they protect themselves. Stone fruit, tropical and pineapple flavours. Unoaked, no malolactic fermentation. Old vines, low yields. Lees ageing. High alcohol, 14%. Lots of flavour, tropical, melon, creamy, buttery, green apple on finish. During our visit we also spent time at the beautiful Vondeling Estate near Voor-Paardeburg, Paarl. Julian Johnsen (an Englishman) and his family own the winery and live on the Estate. Matthew Copeland is the Head Winemaker, and also lives on the Estate. Vondeling own their own vineyards, winery and bottling machinery. It is a much more showy Estate which doubles up as a wedding venue with its own chapel. We did an afternoon’s tour and tasting and then settled in to a poolside Braii with other visitors from the UK, including of course Simon Leschalles and Rupert St Aubyn who support our market in the South West. We were so fortunate to experience life in a South African valley vineyard and got a true understanding of the producers’ devotion to quality wine and sustainable winemaking for the future. It is a memory never to forget. As the Summer approaches, it is time to move on from the big, bold reds that lend themselves so well to cold nights snuggled up by the fire, to lighter reds such as Pinot Noir. If you are lucky enough to see a Pinot Noir grape growing on the vine, it is more of a dusky pink than red or black in colour. It is this pale colour, along with a naturally thick skin that gives Pinot Noir wine its light character. Burgundy in France is arguably the home of the Pinot Noir grape variety and all reds produced in the region must be 100% Pinot Noir. One of our favourites is Domaine Chanson Hautes Côtes de Beaune 2014, a vibrant fruity wine, ideal with cold meat platters, as well as meat sauce pastas and barbecued pork steaks. Domaine Chanson has been handcrafting exceptional wines for over 250 years at their unique Domaine in the heart of Burgundy. With a profound passion for Burgundy’s best appellations, Président Gilles de Courcel, winemaker Jean-Pierre Confuron and their team gracefully express the specific terrior of each parcel of land. In the purest of Burgundian tradition, ageing of wines in oak barrels takes place in Chanson’s own Bastion; a medieval tower which shelters the wines throughout the process. Myth: Tears/legs on the glass mean a better wine. This is false! The wine showing on the inside of the glass when swirled is known as wine tears or legs. It can be a sign of higher alcohol content in the wine, a more viscous wine (think how a dessert wine sticks to the glass), or sign of a dirty glass and unfortunately even when a glass has been through a washer there is still a residue on the glass that can contribute to more visible tears. Steaming and polishing glasses is the best option to reduce this. Myth: The bigger the punt (the indent on the bottom of a wine bottle) the better quality the wine is. This is false! The punt is intended to strengthen the bottle to withstand the build-up of pressure within – most Champagne bottles have a punt for this reason. A punt is better at collecting the sediment at the bottom of the bottle, so it is easier to avoid disturbing it and ending up with cloudy wine. It is used as a clever marketing tool for perceived quality. However, it is the answer to the riddle of how to drink from a bottle of wine when the bottle is unopened! Myth: Red wine should be drunk warm. This is false! Heat will actually damage the delicate flavours of the wine and you could even end up with a fizzy red due to initiating a secondary fermentation! People usually think room temperature is a suitable atmosphere for storing wine but since the introduction of central heating, most rooms are now too warm. The recommended drinking temperature for red wines is between 12 and 18 degrees (cooler for lighter styles, warmer for heavier styles). Almost every bartender has heard those words in the last few years as Malbec has surged in popularity. Here is everything you need to know about this mighty grape variety.